The flight crew took the aircraft through testing that included all flap settings, alternate gear extension, and entry into stalls with stick shaker activation. “The 787-9 is a great jet and we wanted to just keep on flying. It was a no squawk flight, with no issues that we didn’t already know about. The aircraft flies just like the -8. The most challenging part of the flight was actually the approach to Boeing Field due to the amount of traffic.” Captain Mike Bryan. After a day of ground checks and data validation BOE001 is expected begin formal testing on Thursday. Boeing’s 787-9 touches down at Boeing Field. Image: Boeing. 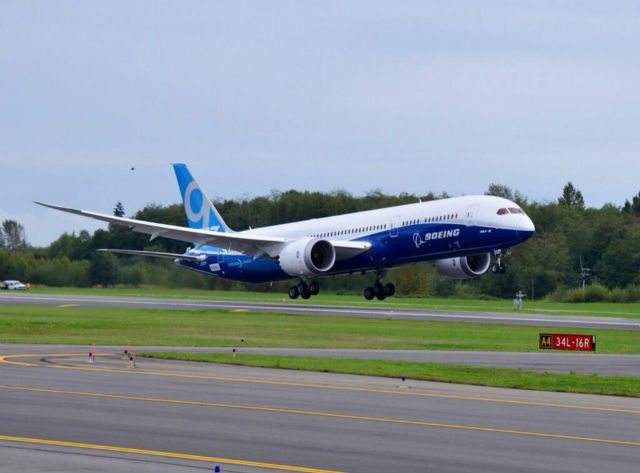 At 18:03 GMT Boeing’s stretched 787-9 BOE001 rotated off Paine Field’s runway 34L on its four to five hour maiden sortie under the control of Senior Project Pilot, Captain Mike Bryan and 787 Chief Pilot Randy Neville. Boeing’s 787-9 takes to the skies for the first time. Image: Boeing. The 787-9 is stretched by six metres and designed to fly 300nm (555km) further than its 787-8 sibling. The aircraft is powered by the enhanced Package C version of the Rolls-Royce Trent 1000 rated at 74,000lbs of thrust, and is the first commercial aircraft to incorporate a hybrid laminar flow control (HLFC) system on the stabiliser. Boeing is also confident about meeting the 787-9s operating targets, with the operating empty weight already believed to be two per cent lower than originally planned. With firm orders for 388 -9s this represents approximately 41.5% of the overall 787 backlog. Importantly, today’s first flight keeps with Boeing’s schedule of delivering the first -9 to launch customer Air New Zealand on time in 2014, without the 40-month delay of the 787-8 programme. Tracking shows the aircraft has followed a standard Boeing first flight sortie, with the aircraft operating in airspace over eastern Washington state. With the recent launch of the stretched 787-10 and ramp up of 787-8 deliveries, today’s first flight marks another step in the growing confidence of the 787 programme. Updates will be posted as the day progresses.